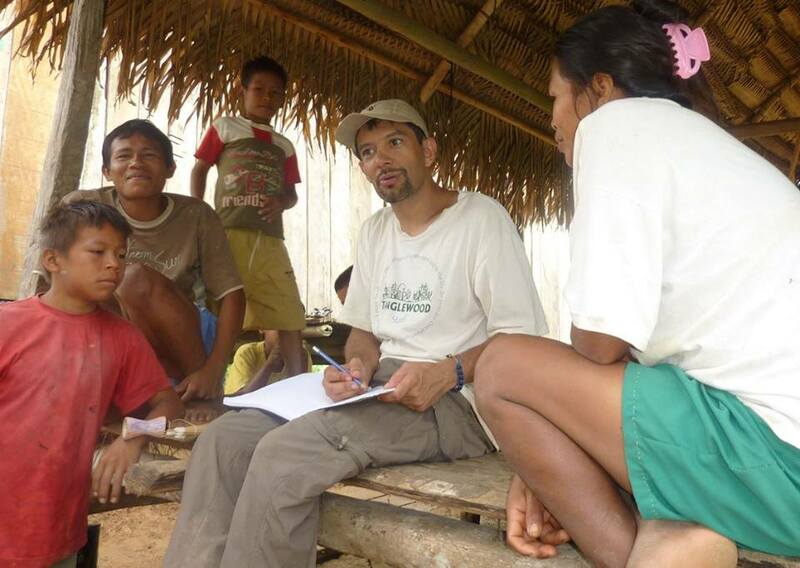 Ben Angulo of Thomaston works with his nonprofit in the Colombian Amazon. On the right is Rosalba, who is a member of the host family that provides housing for volunteers and on the left is Marcelo, a neighbor. One of the kids is Humberto, the other was visiting from Peru, Angulo said. THOMASTON — Ben Angulo of Thomaston does not do a good job of selling life in a tiny impoverished village along the Amazon River in Colombia. He first encountered the people of La Libertad village during a break in 2010. He had wanted to see real village life, rather than sitting around a resort watching tourists enjoy cocktails or going on a pre-packaged jungle tour. What he discovered was his first experience of true poverty in a village of about 400 people. “There were many biting insects, oppressive heat and humidity, terrible sanitation, poor access to food, no clean water, rats at night,” he said, adding that it was hard to sleep. And despite that, the former Rockland Middle School science teacher decided to return, again and again. He founded the nonprofit organization Amazon Pueblo with a mission of helping the villagers live a sustainable life. Angulo, 50, grew up in the Midcoast and graduated from Georges Valley High School. When he was a child he even delivered The Courier-Gazette. He worked as a science teacher in Rockland in 2002-2003. After that he worked in a bilingual school in Bogota, Colombia, from 2003 to 2010. He first visited La Libertad during Christmas break of his last year there. The village is located on the Amazon River near the shared border of Colombia, Brazil and Peru. He added that government corruption is also a major problem. The nonprofit has helped provide basic first aid, nursing and dental services. Angulo hopes that in the future it will be able to provide more potable water and bathrooms (there are only six in the village currently). In addition, it has helped improve infrastructure in the community, adding a cellphone tower, power, a dock, internet service and allowing residents to charge their phones via solar panels. 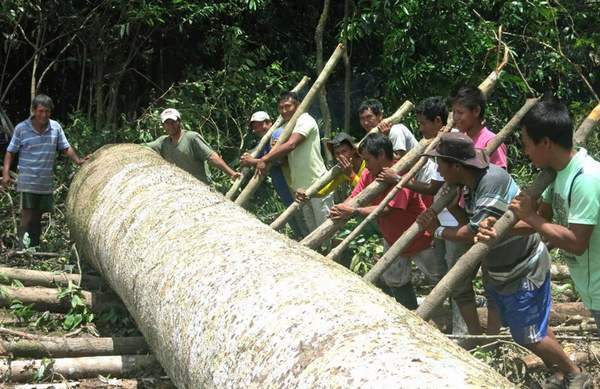 It has also been working on creating a yuca-processing plant and community garden. Last summer he met with the Bixby & Co. in Rockland to discuss the possibilities of providing it cacao in the future. The group also helps bring in volunteers from all over the world to spend time in the village and help with the projects. Midcoast Maine residents have played a big role in making the project successful. Three of the board members are his former classmates from Georges Valley High School: Mark and Julie Brooks of Brooks Trap Mill and attorney Patrick Mellor of the Strout & Payson firm in Rockland. Board member Dianne Russo lives in Searsport. Director Sarah Blackman worked with Angulo years ago at Tanglewood in Lincolnville. His sister, Crystal, another of the directors, has volunteered twice at the village. Angulo spends about six months out of the year working in Maine and the other six in Colombia. He has an apartment and a girlfriend in Bogota. Asked why he cares about people far away from home, he said, “After traveling a lot and spending so much time in Colombia, I do not think of the people as being far away. For more information about Amazon Pueblo, visit amazonpueblo.org or amazonpueblo.blogspot.com. Daniel Dunkle can be reached at ddunkle@villagesoup.com or 594-4401 ext. 122. Follow him on Twitter @DanDunkle. 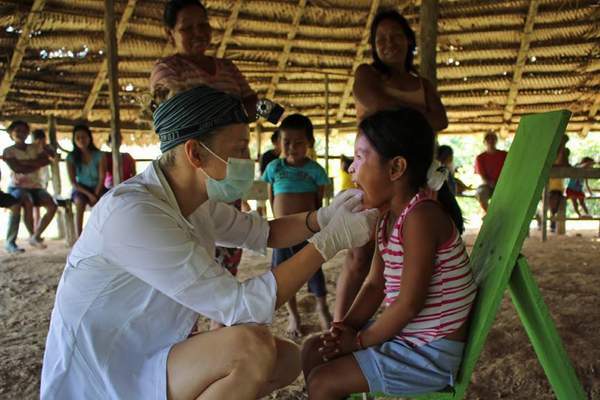 Thomaston-based nonprofit Amazon Pueblo brings volunteers to a remote village on the Amazon River to provide services including basic medical and dental treatment. Sabrina, a dentist volunteering from Canada, provides dental exams for the villagers and teaches oral hygiene. 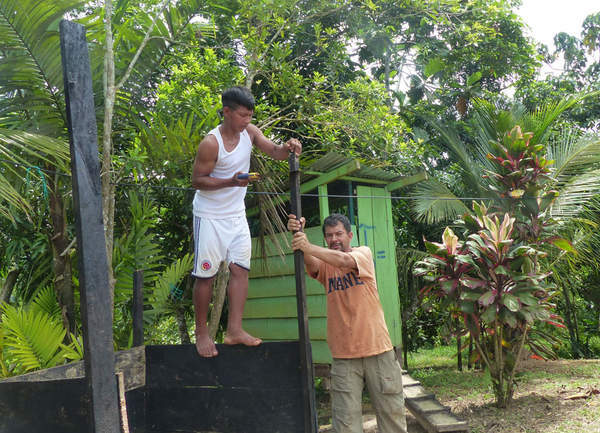 Ben Angulo of Thomaston, left, says the work at the village of La Libertad is hard, but interesting. 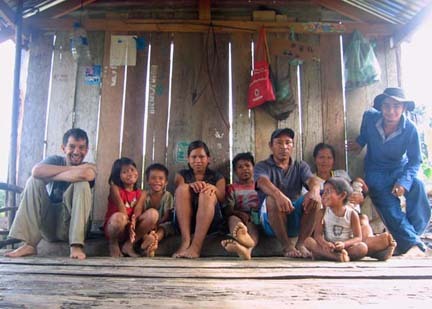 He is pictured on the left with members of Gustavo’s family. 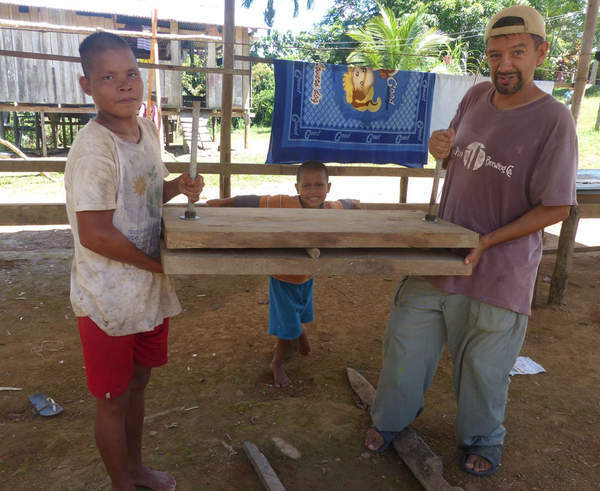 Gustavo provides housing for volunteers to the village. Also pictured on the right is David Acero. 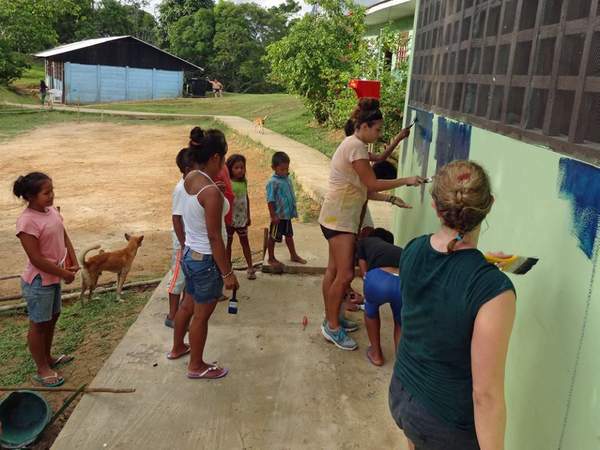 Thomaston-based nonprofit Amazon Pueblo brings volunteers to a Colombian village to help with everything from education to creating sustainable businesses. Here volunteers and villagers paint a world map on the side of the school. 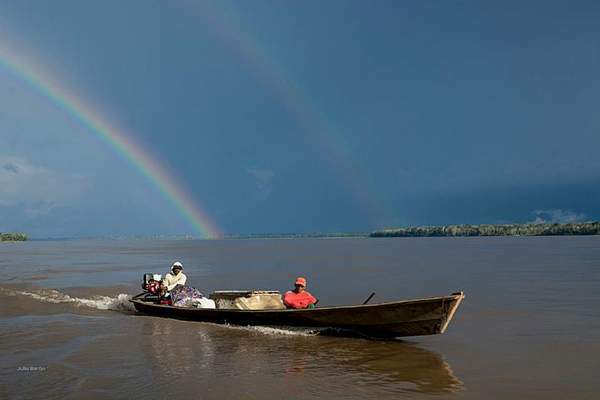 Access to the village is often by boat on the Amazon River. 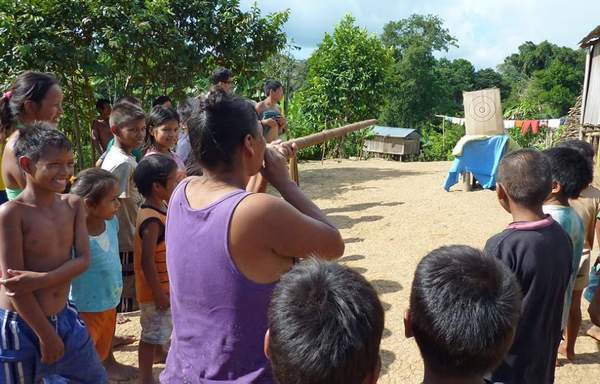 A moment of fun in a village on the Amazon in Colombia. Volunteers from Thomaston-based nonprofit Amazon Pueblo help in the work to make life sustainable in Colombia. 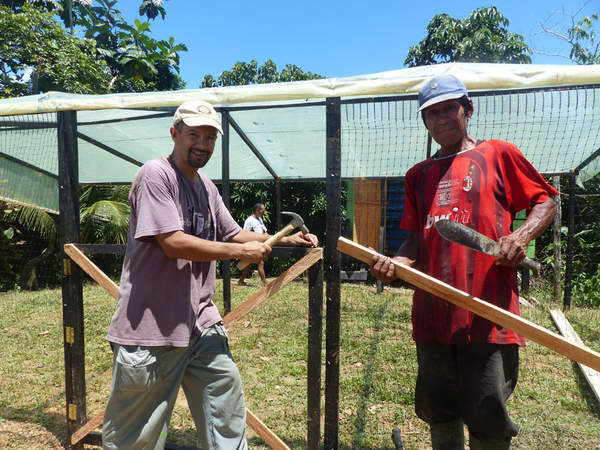 Angulo, left, and Humberto are building a community garden. The plants must be covered by a semi-transparent greenhouse plastic to protect from the full force of the sun and rain. The money for the garden was donated by the Midcoast Maine-based nonprofit Flannel Shirt Fund, which assists schools and communities to build community gardens. Ben Angulo of Thomaston, right, and Elico build a compost bin for the community garden. Rain forest soil is actually very poor and needs added nutrients from compost. Happy Holidays from Amazon Pueblo! Piranha Party Fundraiser 2018: Join the fun!